Sapphire is a cloud-based integrated lifestyle platform, which will bring your business directly attached to your customer and easily connected to other business partner. Interaction – serves profile-driven mobile applications which not only deliver information, but will also directly interact with your customers to build a profile-centric customer database for your deeper business analytics. E-Commerce, this is a rich commerce functionalities. You can boost sales with personalized content, improve conversion with fast checkout, and offer seamless shopper experiences across multiple devices anywhere, anytime. Find out more about our e-commerce platform ETALAZE. Loyalty, this functionalities is a fully customizable and configurable. Our technology provides a SaaS user experience through proprietary web-based and mobile software, empowering marketers like yourself. It allows creation and management of all aspects of your loyalty program including the promotional (CRM) pieces of your marketing strategy. See the Infographic to find out how this system could support your business. Analytics, optimizes your business strategy by providing deep and rich insights from our data analytics based on customer database. The platform integrates not just data but “BIG DATA” from your customers and delivers it in “analytic ready” reports in one single interactive dashboard which you could define based on your unique business or needs. 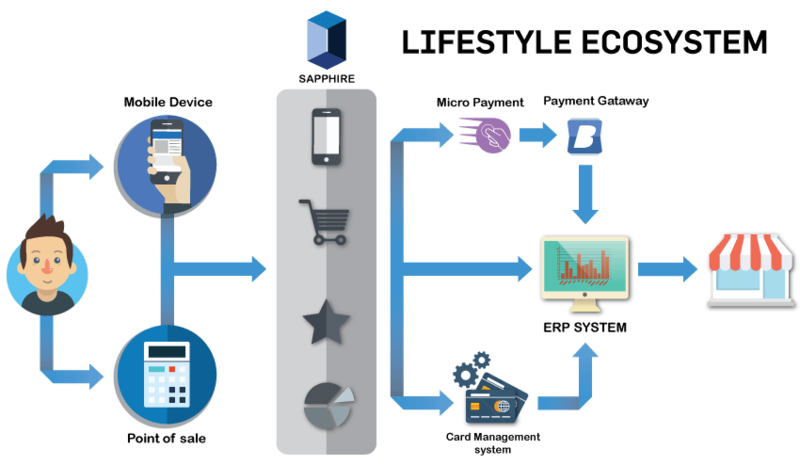 Sapphire the high performance, smart and scalable Lifestyle platform for any size of businesses.